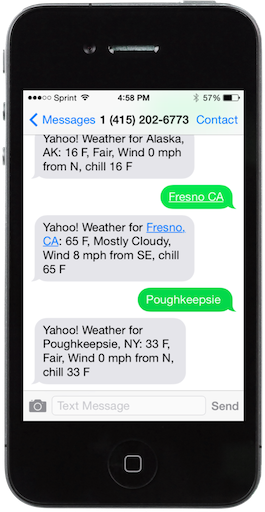 Text your location to 415-202-6773 and receive your current weather conditions and forecast. Built with Twilio, Yahoo! YQL, and Yahoo! Weather. 2019-04-10 Note: this service is temporarily broken now that Yahoo shut down the YQL service. I'll need to go back to the drawing board to fix this because it relies on a few different YQL queries! Copyright © 2014-19 Brian Cantoni (www.cantoni.org). Contact: info at scooterlabs.com.